As shown at the end of each page we accept PayPal, which represent the easiest and fastest way to make and receive payments in all the values. 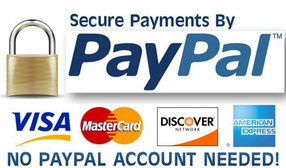 With PayPal you can pay without any registration, using your credit cards, bank account and more. We also accept payment through Bank Transfer, and all the major credit card (VISA, MASTERCARD and AMERICAN EXPRESS), Bank Transfer generally takes from 2 to 5 working days to be cleared in our bank account. When your payment will be charged to our bank account we will process your order. Please to know how to buy go here. Our website accept all of the international values, like US dollars, Australian Dollars, GBP, euros and more even if the price of every item on our website is showed in EUROS (€) because we are Italian. However PayPal convert every values into euros before to pay using PayPal itself, in that way you know how much you'll pay exactly. The same think happens if you pay with credit card and Bank Transfer. As soon as possible we will introduce new values inside the website such as US dollars, GBP, and many other.